I don’t know what to say; feel like crying; tears welling as I write. It’s October 29. The year is 2012. It is said that there are no coincidences, and I believe it. It is said that we can never know the chain of cause-and-effect consequences of any action we take or don’t take, big or small, and I believe it. It is even said that there is no such thing as cause and effect, anyway, since that implies time and time is but an illusion; that there is only relationship; and I can believe that, too. It is said that we encounter angels in our lives every day if we would but be present and notice them. And I definitely believe that, as well, for today I met one. I’m sitting at a table on the patio outside the Starbuck’s in Big Bear Lake, California, nursing a large medium roast coffee as I read friend Sharon’s just published book. A couple of young men sit nearby, chatting. A homeless man walks up and stands to the side, muttering like he wants to start a conversation. And most likely panhandle, I figure. The other two young men get up and sort of drift away. My first reaction is to focus on my book, pretend I don’t hear or see, and hope he gives up and wanders away to seek his fortune elsewhere. Then I remember another book, a novel, recently published by another friend, Ken. One of its main characters is Linda, who has tumbled from a successful nursing career to surviving panhandling on the streets of San Francisco and grabbing bites when she can at a local Carl’s Jr. So, I look up into the eyes of a fellow human being and ask him how he came to be homeless. He’s in his late 30s or early 40s, slender, about 5’9” or 5’10”, unshaven face, thinning close-cropped hair, ruddy complexion. He’s clearly been in the sun. He lost his job in Indio, doing something with cinder blocks, he says. Then he lost his home. Then wandered, on foot, north, up into the mountains, landing in Big Bear Lake. Sleeps in a sleeping bag somewhere “over there,” he points vaguely in the direction of the lake. When I ask what he does with the money people give him, he says he buys foot-longs at Subway, which he rations to last several meals. Since he’s smoking a cigarette, I observe that it must be a pretty expensive habit these days, what with all the taxes on them. He admits that he’s bummed it off of someone, that there’s no way he could afford to buy them. He says that smoking helps him get to sleep at night, it gets so cold. Has he spent a winter here yet? No, not yet. I advise him to get back down to the valley before the snows set in up here in a few weeks. I am really touched by him and his story and say I’ll give him a couple of dollars towards a sandwich. In my wallet, though, there are no singles and nothing less than a ten. So, I give a what-the-hell shrug, mutter something about not having change, and, not wanting to ask him if he does, hand him the ten. I wish him well on his journey as I turn my attention back to my book. He asks what is it about. Not wanting to engage in a much longer conversation, I say briefly that it’s about private citizens taking initiative to bring peace between America and the Soviet Union/Russia. He looks quickly at the book and, as I return to reading, wanders off. A few minutes later, he’s back, holding out to me his cap! I did something for him and, he says, it’s only right that he does something for me. And offering me his cap is all he can do. Then he apologizes that there are some smudges of dirt on it. No, I protest, I can’t take it! He needs to keep his head warm on these cold nights, I say. He insists quietly that, no, it’s really OK; he has his beanie, which he proceeds to pull out of his pocket to show me. I see this act of gratitude on his part means a lot to him, to offer something in exchange, so I hold the cap over my heart and thank him softly, feeling deeply grateful myself for the blessings and meaning this gift carries with it. Go with God, I whisper as he wanders off again. 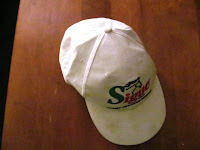 Then I notice that the brim and one side of the head of the cap are damp and smell of Starbuck’s restroom soap. He tried to clean it off before giving it to me! I put down the book and pick up my pen. Note: Sharon Tennison’s book and Ken Aslanian-Williams’ book are both available at Amazon and, I’m sure, elsewhere. This is beautiful–brimming with humanity. Thank you for sharing this story. In the synchronicity of angel work, this is the very thing I needed to read today. I am feeling with you with tears in my eyes, too. Thank you for making my day with this deeply moving story. Ditto to all that others have said. I, too, found your piece beautiful and deeply moving. A wonderful example of the meaning of 'human family'. Plus it happens that I was also involved in citizen diplomacy with the Soviet Union in the 80s and knew Sharon Tennison briefly. Your piece was a lovely experience of oneness. Many thanks and many blessings. What about taking him by the hand, putting him and his things in your car and finding a local shelter and help center. That is, if he would go. I do not know how I missed this. Thanks for the reminder we are not the dollars we have we are our humanity.